Discussion in 'UFC Discussion' started by Fireflies, Jul 31, 2016. Eddie, Khabib, Tony, RDA, Edson after they've been matched up too. This is why anybody has a chance at becoming champ. 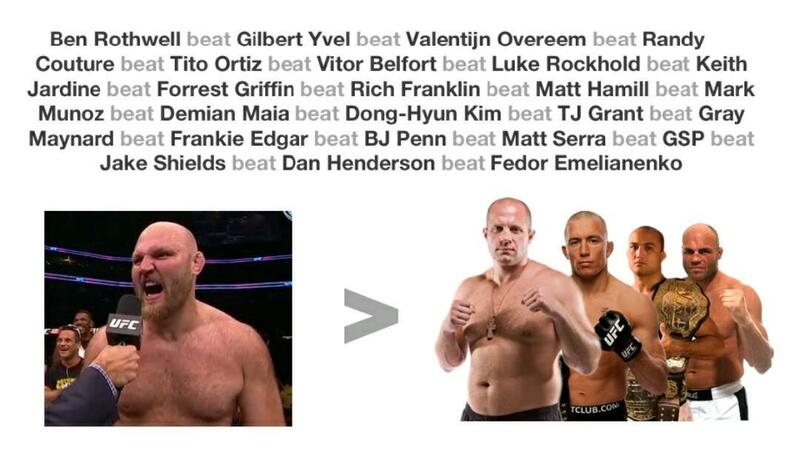 Take this for a made up example Conor moves up... Edgar could lose to Aldo x3/x4 times & Aldo would be full champ then Holloway could come along, have a style that could upset Aldo & become the new champ... then Edgar could fight Holloway & absolutely dominate him to become the champ after losing to Aldo 75 times. ^^ That's not my opinion on what will happen, or what I think would happen it's just a made up concept to try & put out my point. MMA is just too unpredictable. Why would you need evidence. It's been a fact for over 20 years. My game is based on the whole idea. Because fans one minute say Edgar is all wrong for Conor... then Aldo beats Edgar then all of a sudden it's a garanteed win if Conor ever fought Edgar based on comparing both their performances. As soon as a guy loses he's already an auto win for a guy who's not even fought him yet in when it's clearly not true at all.